The series will be produced by GENCO (of Kiniro Mosaic and Prison School fame), with scripts handled by the original scenario writer for the game, Takashi Masada. All this news comes from an event in Tokyo on Friday night. 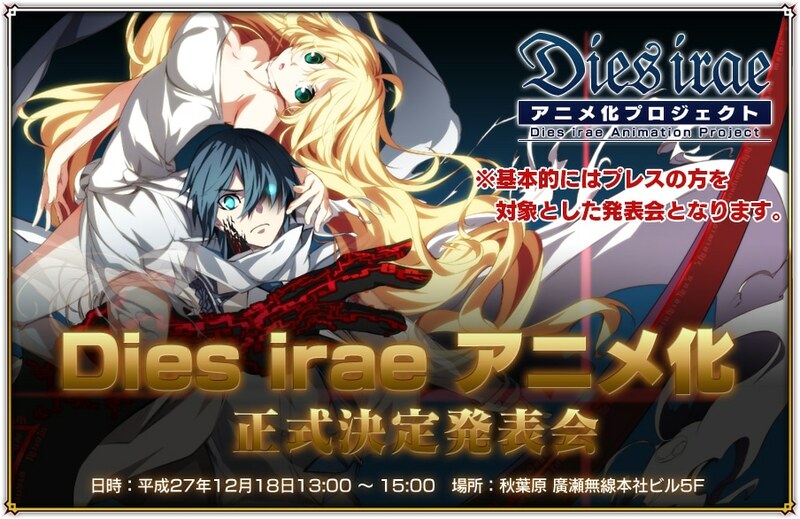 The event also had announcements of a new side story game titled Dies irae ~Interview with Kaziklu Bey~ set to release in March 2016, an original art exhibition in Tokyo from January 9-11, 2016, as well as manga andnovel adaptations. The manga will be drawn by Kazuomi Minatogawa set to start in the March 2016 issue of Kadokawa’s Dengeki Maoh magazine, which releases on January 27. The light novel adaptation will be written by Ryou Morise, the scriptwrite for Nitroplus Blasterz: Heroines Infinite Duel and scriptwriter for School-Live!, and will release in spring 2016.